Writer J. Parker Huber commissioned Michael Singer to design a private residence for a one-half acre site overlooking the Connecticut River in a residential area. The key design guidelines for the 1,300 square foot residence included energy efficiency (passive solar design and radiant heat), habitat restoration and privacy. Precast concrete walls and a wooden trellis form the front of the house, screening it from the street. The back opens to views of the mountains and river below. The fifteen-foot-high living room is the center of the house, wrapped by a small bedroom, office and kitchen. Singer lowered the land in the back of the house to reveal the river. The earth from this excavation was transferred to the front yard, creating twelve-foot-high shaped earth mounds. Alongside the mounds, a grove of indigenous trees in the front yard provides a distinctive and private setting for the residence. 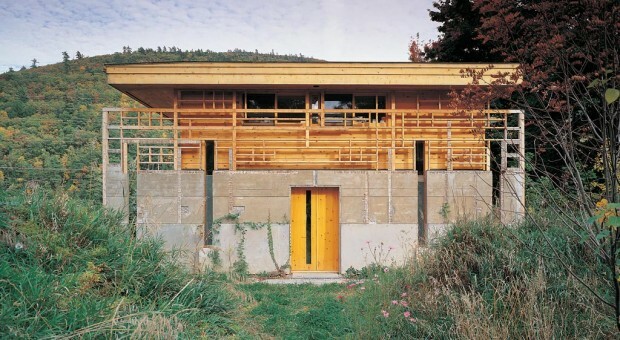 This project was selected as a Record House and published in Architectural Record in April 1999. In 2008 Parker Huber commissioned Michael Singer for an additional 600 square foot cottage adjacent to the house utilizing similar materials and design principles, with the addition of a solar hot water and radiant heat system.